The Staff List page lists the names of individuals who hold positions in the selected organization. This topic describes the main elements on this page. The Staff List is a complete listing of staff members who hold positions in the selected organization. Key elements of the page are identified in the callout links in the illustration below. Place your mouse pointer over a link (without clicking) to view a brief description of the element. The organization associated with your ParishSOFT login credentials automatically appears in the Organization list, as shown in the upper-right corner. If you manage multiple organizations, select the organization whose staff members you want to view. Or, select All Organizations to view staff in all of the organizations you manage. If you select an organization for which you do not have viewing rights, a message is displayed to inform you that you are not authorized to access the organization. See your System Administrator for assistance with accessing an organization for which you are denied access. The filters enable alphabetic and numeric filtering of information contained in columns in the grid. Alphabetic filters enable you to find and sort information in columns that contain alphabetic information, for example, the Name column. Numeric filters, on the other hand, enable you to find and sort information in columns that numeric information, for example, the Date of Birth column. See Rolodex_Filters for step-by-step instructions that show you how to apply the filters. The Filter Column field shows the name of the column to which the selected filter is applied. It also tells you the direction in which the information is sorted: Ascending or Descending. In the previous illustration, the Filter Column field shows Name Ascending, which lets you know that the information in the grid is currently sorted on the Name column in ascending (A to Z) order. Click Clear Filter to clear the applied rolodex filter settings. The system re-displays all of the staff records (the unfiltered list). The Filter Criteria field updates to show that filtering is turned off: None. The toolbar is located at the top of the grid under the row of rolodex filters. The toolbar contains menus and buttons you can use to perform common Staff List functions. The default number of records per page is 10. If you change the number of records and want to keep the change in effect, click to save the selection. Every time you open the Staff List page, the system shows the number of records per page you selected. ● if you change the page layout, clicking this button saves your new layout. ● if you change the layout, clicking this button resets changes to the page layout back to the default configuration. ● enables you to select specific columns to include in the grid. ● sends an email to selected staff members. See How to Send an Email to Staff Members for instructions. ● displays the Advanced Filter setup window where you can enter multiple criteria (for example, last name, phone number, and email address) to search for records matching all of the criteria you specify. For instructions on using this filter, see Advanced_Filter. ● exports staff records to a .csv file. For detailed instructions, see How to Export the Staff List to a .csv File. ● adds new staff record to the Staff List. For detailed instructions, see How to Add a New Staff Member. ● deletes the selected staff assignment from the Staff List. For detailed instructions, see How to Delete a Staff Assignment Record. The Staff List grid is an alphabetic listing of all of the staff members in your organization. Each staff record occupies a single row in the grid. Columns display relevant information, such as the staff member's name, date of birth, the primary position held, and telephone number. The list can contain up to 16 columns of information. If you only want to see a certain type of information, you can customize the list by selecting specific columns to include. ● Sortable: click a column header to sort entries in the grid based on the information in the column. For details, go to Sorting_the_Display_of_Records. ● Resizable: grab the border between two columns to increase or decrease the width of one of them. For details, go to Changing_Column_Widths. ● Moveable: drag and drop columns in the grid to suit your preference for viewing information. For details, go to Changing_Column_Widths and Rearranging_the_Columns. The column headings identify the type of information in the Staff List. You can rearrange the columns with a few simple clicks and widen or narrow them for optimal viewing of information. You can also sort the information in the list based on a specific column's information. : this checkbox control enables you to select individual staff members whose records you want to work with. For example, if you want to send an email or delete a specific staff assignment from the grid, first select the checkbox to indicate which records you want to work with. Then, perform the desired action on the selected record. 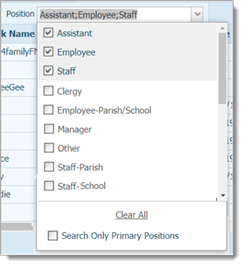 (the column header): select this checkbox in the column header to select all staff members in the grid. : opens the staff member's Member Details record in Family Directory. If desired, you can put the record in edit mode and make changes. For details, see How to View or Update Details in a Member's Family Directory Record. Clicking the name link opens the staff member's assignment record. The record contains details about the member's position and assignment and shows current access rights settings. If desired, you can put the record in edit mode and make changes. For instructions, see How to View or Update a Staff Member's Assignment Record. Each entry in the list occupies a single line. To bring the information that extends beyond the borders of the page into view, click and drag the horizontal scroll bar at the bottom of the list left or right. If the grid contains multiple pages, the number of pages is displayed below the grid. Select a page to go directly to that page in the list. Alternatively, click to page back or click to page forward through pages in the grid. The number of records appears in parentheses.